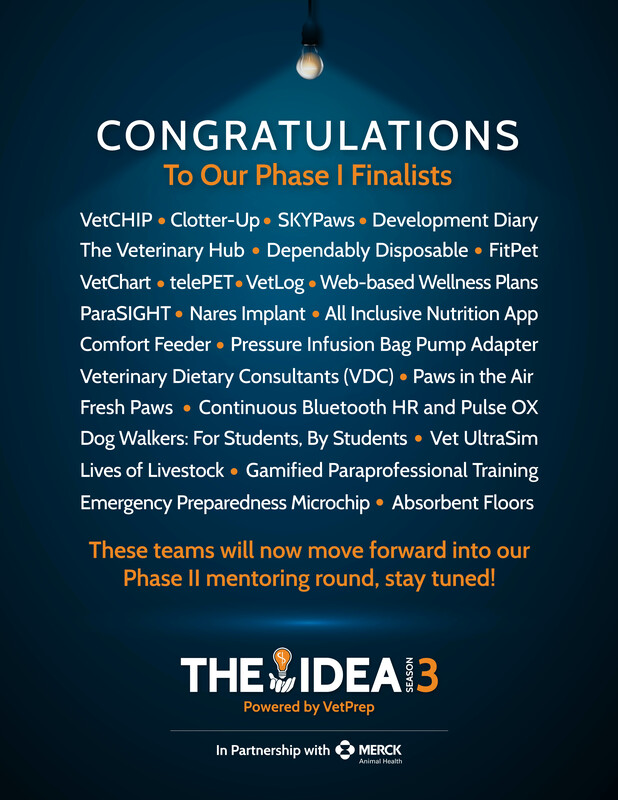 SOLANA BEACH, Calif., August 15, 2018 – VetPrep, creator of The IDEA Veterinary Innovation Competition, in partnership with Merck Animal Health (MAH) is excited to announce twenty-six teams will advance to the semi-finalist round. The IDEA is intended to stimulate and develop creative ideas from young veterinary problem solvers, pairing students (both individuals and teams) with mentors who collaborate to further grow the innovative ideas. The semi-finalists will continue developing their ideas and designing their proposals through the end of the year. Entries vary from services such as “Dog Walkers: For Students, By Students” to web services that assist veterinary students and veterinarians such as “VetChart” and “VetLog”, high tech monitoring devices such as “SkyPaws” to innovative health devices and other products such as, “VetCHIP”, “Absorbent Floors” and “Comfort Feeder”. For more information about the competition, please visit https://info.vetprep.com/the-idea. A group of mentors and guest speakers will provide valuable resources to assist in the process of finalizing each team's proposal due on Dec. 31, 2018. The three finalists will then be chosen by a panel of judges from the veterinary community based on the submitted proposals. We are very excited to receive the quality and quantity of applicants in our third year of THE IDEA competition and look forward to working closely with all the teams. We will then move toward the next stage of selecting the three finalists who will ultimately compete in a live presentation at SAVMA March 2019. The live finale of The IDEA will be held in March 2019 at the SAVMA convention in Georgia where the top three teams will present their ideas to judges from industry and academia and take home a total of $17,500 in cash prizes, specifically geared toward bringing their innovations to market. “I have been so inspired to see the entrepreneurial mindset of future veterinary professionals. The 26 proposals we have selected to move on to the next stage of the competition continue to give me a fresh perspective on the creative minds that are entering our profession and I can’t wait to see where they’ll lead us,” said Dr. Andrea Dover, The IDEA Competition Director and Program Manager at VetPrep.